Posted on July 27, 2015 by Kelsey H.
I recently read the classic novel The Scarlet Letter. I really enjoyed the dramatic story of Hester Prynne and her daughter Pearl as they live in a strict Puritan society. Nathaniel Hawthorne was clever in his symbolic elements to highlight the importance of such things like the scarlet letter itself, her daughter Pearl, and Mr. Dimmesdale among others. To give a brief description of the story: The novel opens with a woman named Hester Prynne being publicly scorned after her release from prison. The reader is informed that she was convicted of adultery and as punishment must wear a scarlett letter “A” sewn onto the breast of her dress. She is holding her daughter in her arms who we later find out is named Pearl. As the story progresses Hester and Pearl face challenges for being outcasts of their society. But Hester’s love for her daughter and her strength in character get them through along with the help of a sacrificial man (whose name I will not reveal because no spoilers!) The story ends dramatically but you will have to read to find out! I loved how Hawthorne ended the book because he brought closure with a tiny cliff hanger that perfectly balance the other out. My favorite character is Arthur Dimmesdale-the adored priest of the town who saves Hester from having to give up her daughter. His charm and genuine heart carry off the pages and into the hearts of the readers. The dreary character of Robert Chillingworth gives an eerie vibe to the story when he sets out for revenge against his wife and her mysterious lover. The story and the characters come together in this Puritan society through love, revenge, and more, and it is definitely one of my favorite required reads so far. All in all, this twisted love triangle story is a classic for a reason. I love the writing and though the vocabulary is tricky at parts, this book is definitely recommended by me! 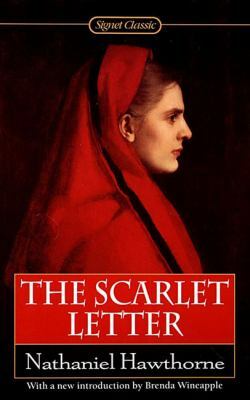 The Scarlet Letter is available for check out from the Mission Viejo Public Library and Overdrive.